ONCHAN, Isle of Man – February 23, 2017– PokerStars Festival will make its debut in Rozvadov, Czech Republic, for a 12-day poker spectacle featuring 37 events and a €500,000 guaranteed Main Event prize pool, sponsored by PokerStars, an Amaya Inc. (Nasdaq: AYA; TSX: AYA) brand. PokerStars Festival Rozvadov follows PokerStars becoming the first international online casino and poker brand to be licensed under the Czech Republic’s new gaming regulation, and is the second PokerStars Festival of 2017 after PokerStars Festival London in January and third ever after PokerStars Festival New Jersey last year. The tour will continue on to Chile in May, with stops including Marbella, Korea, Manila and Uruguay to follow. From March 2-13, Rozvadov, a small municipality in the Czech Republic, will be home to PokerStars Festival Rozvadov. The famous King’s Casino will host The Festival which will feature a variety of tournaments including the €2,200 PokerStars Festival High Roller, the €550 PokerStars Super Deep and the €275 PokerStars Open. PokerStars TV will broadcast the PokerStars Festival Rozvadov Main Event coverage on Day 2 (March 12) and during the final table on March 13. The stream will be available in German and English on PokerStars.tv, Facebook, YouTube and Twitch. Players can satellite into the Festival from as little as €1.10 on PokerStars.com and PokerStars.eu with qualifiers running until March 5. Multiple daily €1.10 phase tournaments are currently running, until February 26 when an €82 re-entry Special Qualifier with 20 seats guaranteed will take place. As well as exciting poker action at the tables, there will be plenty of other activities for players to enjoy including a special StarsFun Power Hold’em tournament on March 8, daily virtual reality experiences in the Player’s Lounge, and the Player Party at the King’s Casino on March 10 from 9pm. There will also be a 24-hour buffet available every day, PokerStars merchandise, and shuttles to and from hotels throughout the event for all players. Players can also take advantage of cash game tables at any time of the day. In addition to all of this, Team PokerStars Pros Bertrand ‘ElkY’ Grospellier and Marcin Horecki, and Team PokerStars Pro Online member and Twitch hero Jaime Staples will all be in attendance to give players a run for their money. Players will also have the chance to have their poker questions answered at an unmissable, live streamed Q&A session with ElkY and Staples. The session will be introduced by poker evangelist, Lee Jones, and held in the Player’s Lounge at King’s Casino on March 11 at 1pm. In 2015, Eureka Rozvadov had a total of 682 registered players for a combined prize pool of €661,540 making it the biggest PokerStars sponsored live event ever held in Rozvadov. 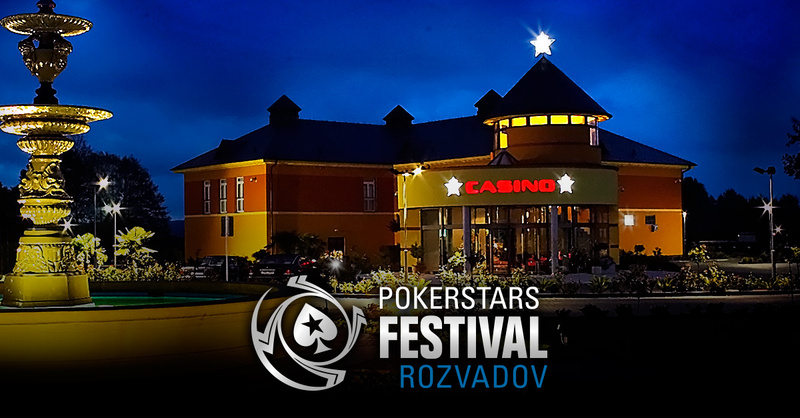 For further information on PokerStars Festival Rozvadov and its full schedule, please visit http://psta.rs/2iGzn2a. For more details and enquiries, please contact press@pokerstarslive.com. The PokerStars Championship, sponsored by PokerStars, is the world’s biggest poker tour. Bringing together some of the world’s most exciting and prestigious poker tournaments, the PokerStars Championship replaces some events previously part of the European Poker Tour, North American Poker Tour, Latin American Poker Tour and Asia-Pacific Poker Tour. Collectively, these events have paid out well over $1 billion in tournament prize pools globally on five continents since 2004. Confirmed PokerStars Championship sponsored live events for 2017 include the Bahamas, Panama, Macau, Monte-Carlo and Barcelona, with more events to be announced in the coming months. PokerStars Festival events, sponsored by PokerStars, are mainly tailored for recreational players and replaces some events previously part of the UK & Ireland Poker Tour, France Poker Series, Italian Poker Tour, Estrellas, Eureka, Asia-Pacific Poker Tour and Latin American Poker Tour. Confirmed 2017 PokerStars Festival sponsored live events are Rozvadov, Korea, Chile, Marbella, Manila and Uruguay with more events to be announced. PokerStars Championship and PokerStars Festival poker tour brands are ultimately owned by Amaya Inc. (Nasdaq: AYA; TSX: AYA). Further information on the PokerStars Championship and PokerStars Festival is available online at www.pokerstarslive.com.